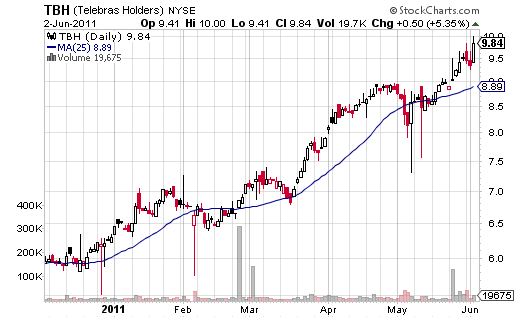 Our ETF pick for June 2011 is TBH (Telebras Holders). This ETF tracking the Brazil telecom stocks is one of the few ETFs still in a uptrend. Remember that we do not follow our free picks and we will not issue a sell alert for this ETF on this page. Only our paid subscribers get access to our real time trading alerts.